Forward: Special thanks to collectors Alan Kastner and Michael Jack for answering my questions and providing much of the information detailed in this listing. 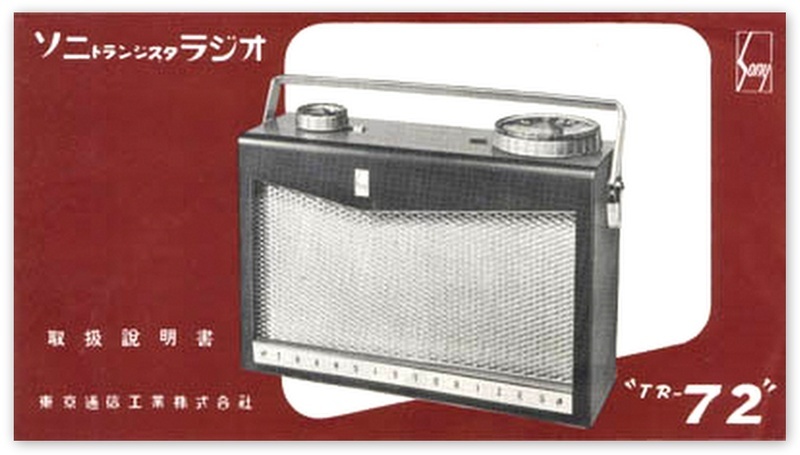 Tokyo Tsushin Kogyo Ltd released the stately Sony TR-72 onto the Japanese market in December 1955, just four months after the company's first production model, the Sony TR-55 went on sale (Ref 1a). 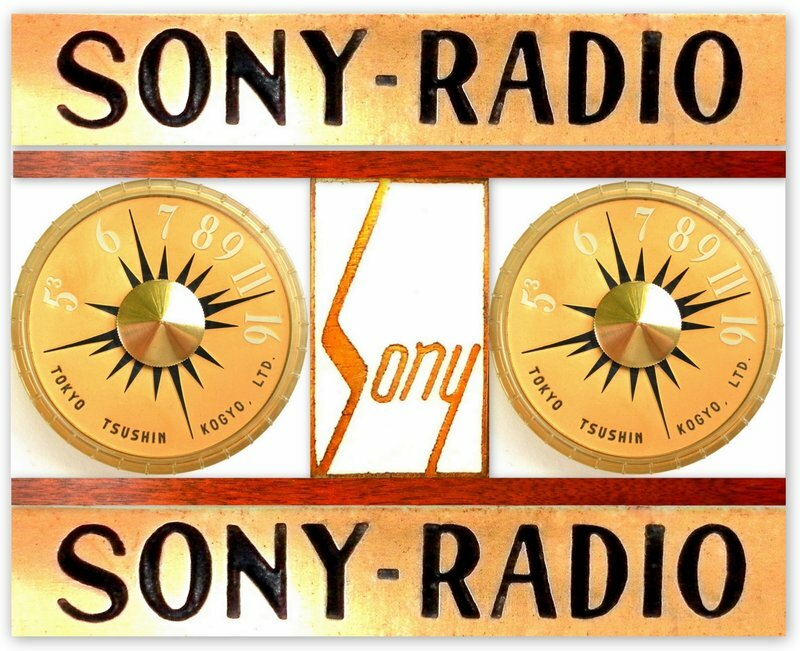 Note that at this time Sony was still a brand name and it wasn't until January 1958 that Tokyo Tsushin Kogyo Ltd adopted 'SONY' as its corporate name (Ref 1b). 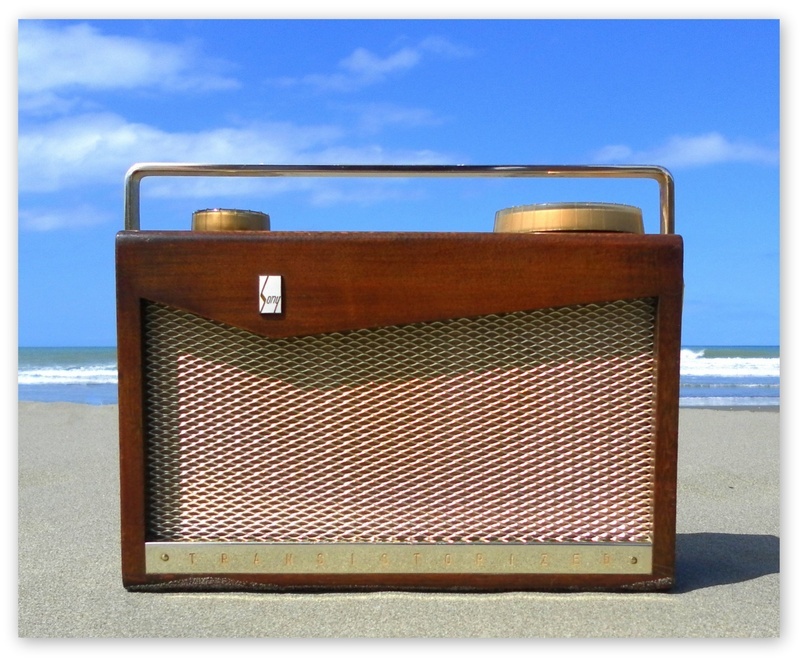 Some commentators refer to the TR-72 as the second Sony model, dismissing the TR-2K and TR-33 earphone only sets, released in September and October 1955 presumably because they did not include an amplified output and speaker. The TR-72 had a production run of approximately four years and it is reported that about 40000 units were made and exported as far afield as Canada, Australia and the Netherlands. The fairly low serial number of 4035 exhibited on this TR-72 would suggest that it was probably manufactured in early 1956 or maybe even late 1955. This is one of the earliest examples with 'TRANSISTORIZED' engraved on a metal strip at the bottom of the speaker grill. Later models have 'SEVEN TRANSISTOR' engraved on this plate. 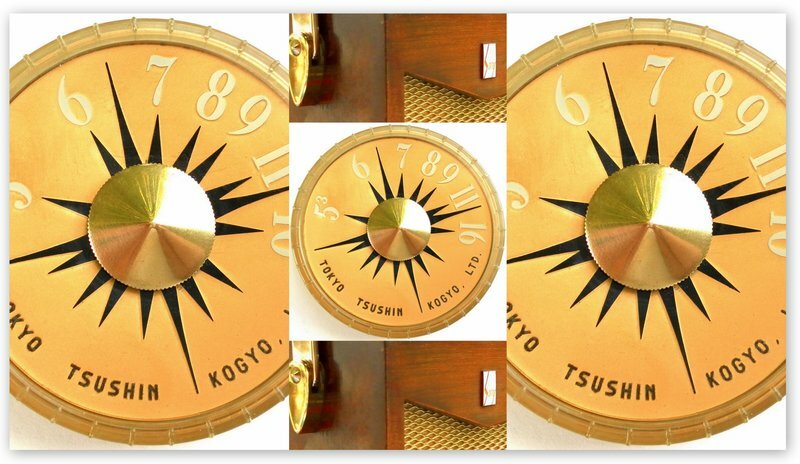 This example also has Tokyo Tsushin Kogyo Ltd printed on the elegant under-painted gold tuning dial. The TR-72 was very popular in Canada where they were imported by Gendis (General Distributors) and have 'Gendis Sony' printed on the dial. 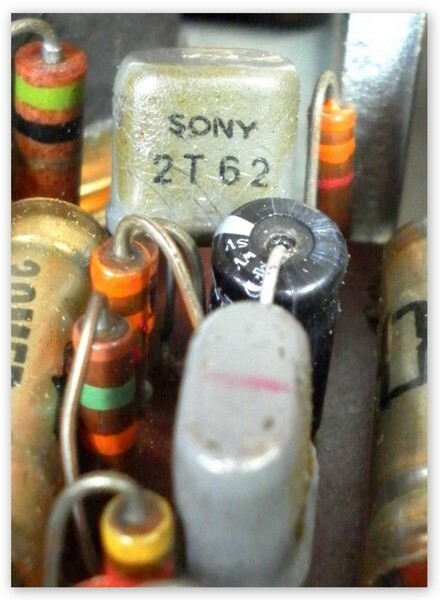 This TR-72 has the old Sony logo on an enamel badge attached to the front, as does every other example of this radio that I've seen, even those sold in the late 1950's. This is interesting because Sony stopped using this logo in 1957, changing it to the one we are all so familiar with today. 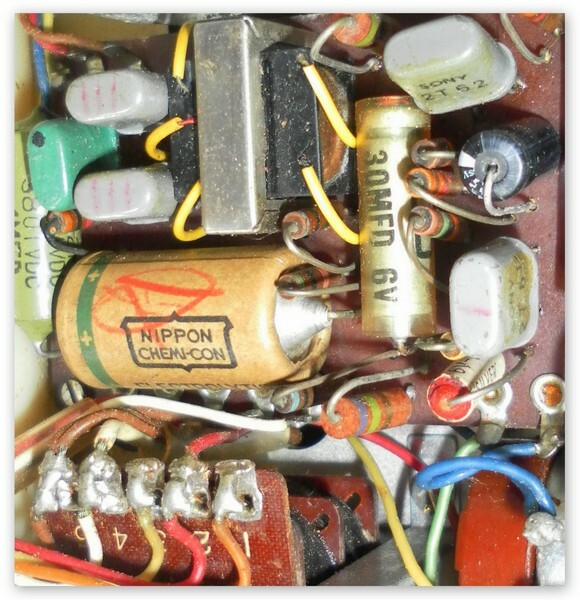 The metal strip on the back is marked 'Sony Radio, Model TR-72, Tokyo Tsushin Kogyo Ltd, Made in Japan'. 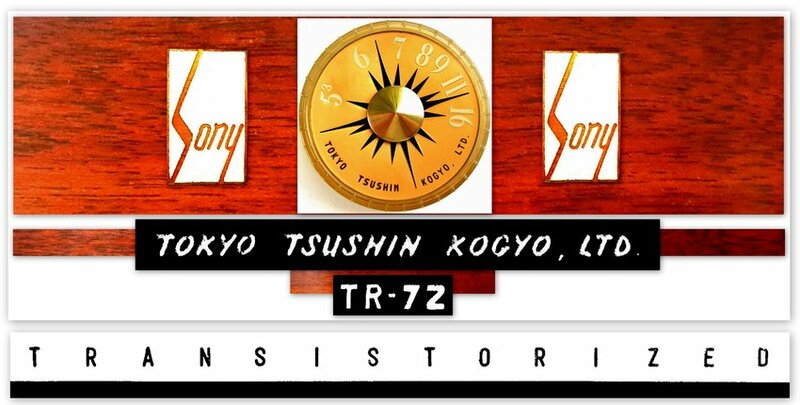 Later models sporting 'SEVEN TRANSISTOR' on the front have 'Sony Corp' on the back in place of 'Tokyo Tsushin Kogyo Ltd'. The chassis is encased in a cherry wood cabinet measuring 10.2 x 7 x 3.3 inch. They can also be found in light wood and dark wood and with different wood coloring treatments and the age factor added in almost no two examples look alike! 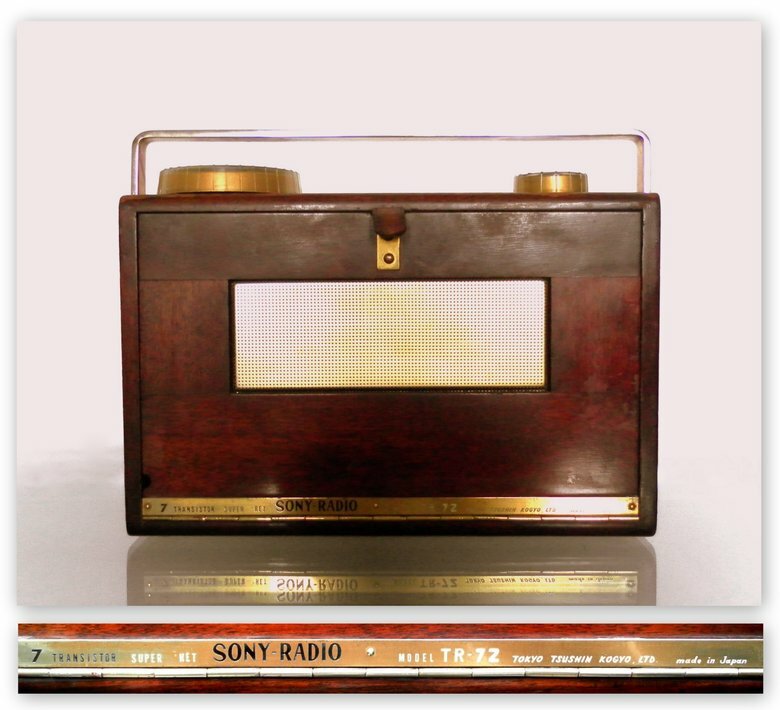 When I asked collector Alan Kastner about the wood used he pointed out that Sony used four different cabinet makers over the life of this model and the material was also changed a number of times. 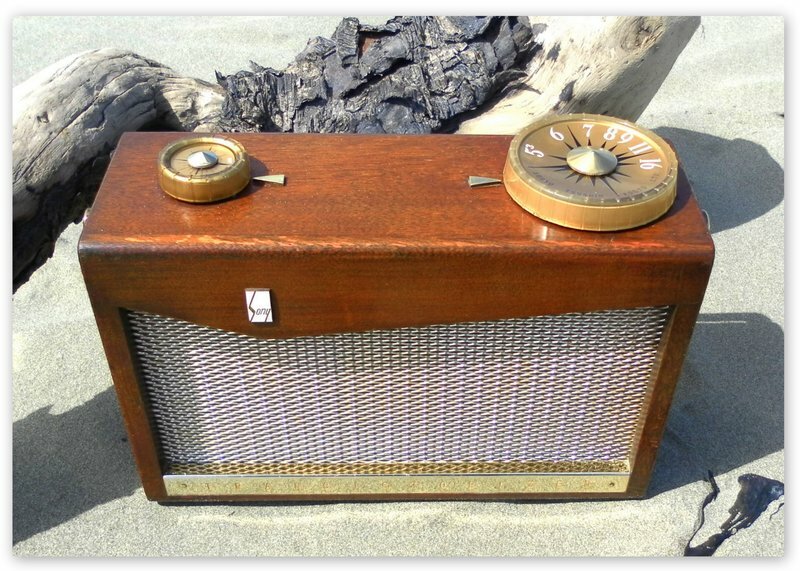 Early models use cherry wood. 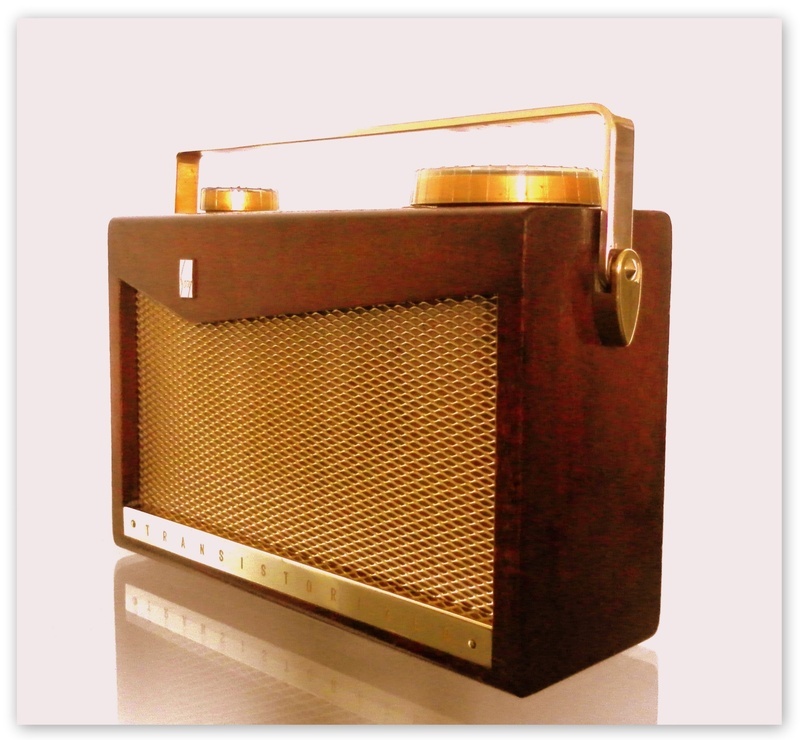 This radio can be found with two types of leather case, one that fully encloses the radio and one that leaves the tuning and volume dials free to operate. Unfortunately I have neither. 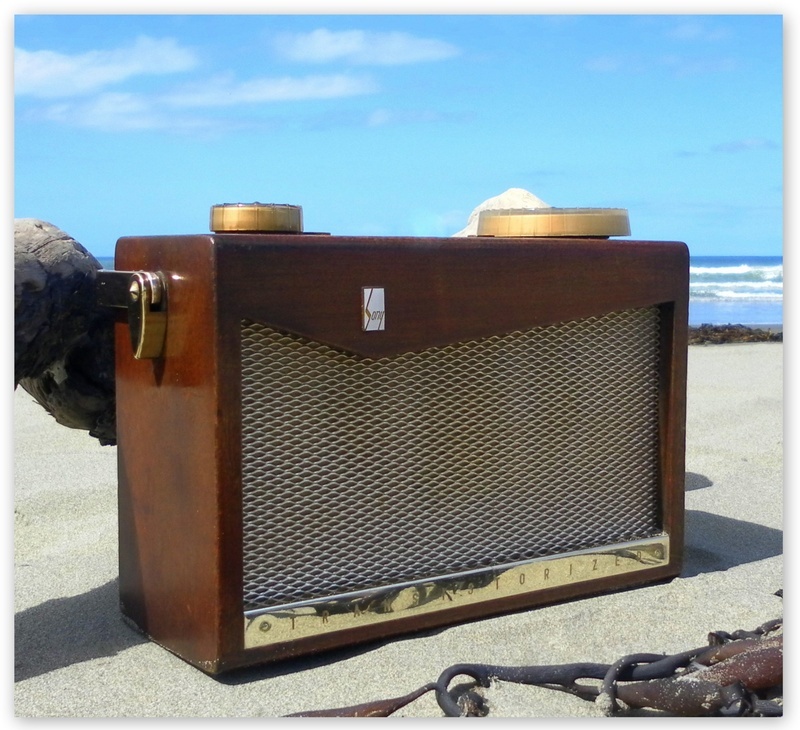 This radio has a somewhat nautical theme to it. 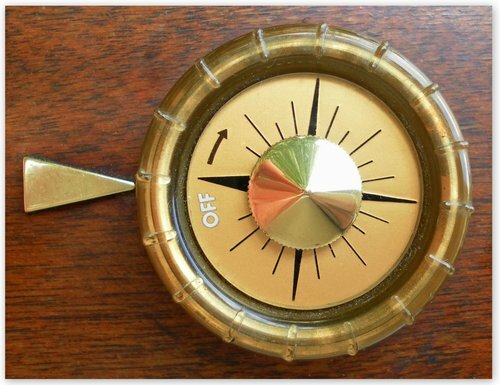 Take a closer look at the volume and tuning dials, their appearance appears to have quite a bit in common with a classic ships wheel. Add to this the fine cherry wood cabinet and the polished brass handle, seafaring materials that would not have been out of place aboard the Titanic! Oh and before we cast off, the top of the offset speaker grill is reminiscent of the keel of a large ketch riding low in the water... well either that or maybe I've just had to much sun! This is the cover of an early TR-72 manual, as seen on Jinkei Ohta's site. 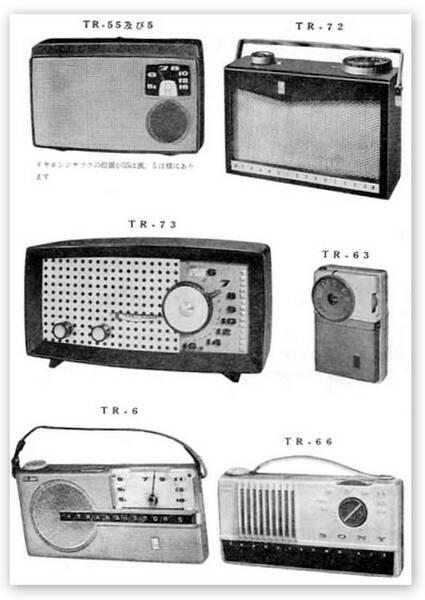 Early advertisement for the TR-72 as seen on the Radio Shack site. When the TR-72 first went on sale in Japan it sold for a whopping 23900 yen ($66USD). At the time this was equivalent to one or two months salary for a graduate! 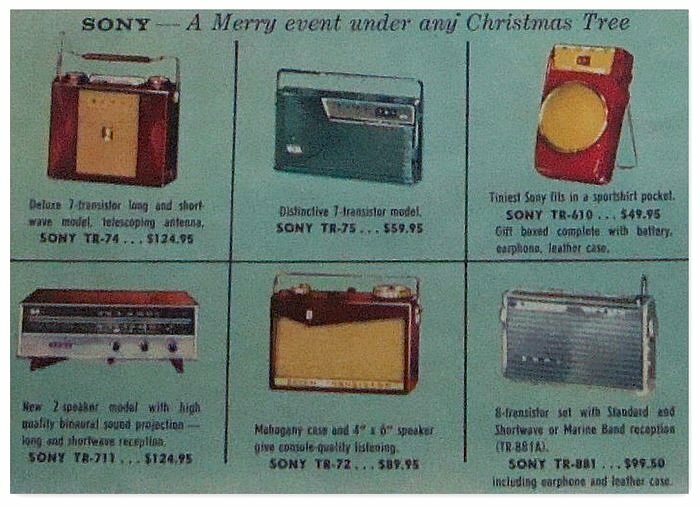 On the 12th of December 1959 the TR-72 was advertised for $89.95 in 'The Star Weekly' of Toronto. At the time it would have been quite an expensive Christmas present! The chassis of this hand built TR-72 has all the hallmarks of an early model as evidenced by the low serial number and other unique identifiers. 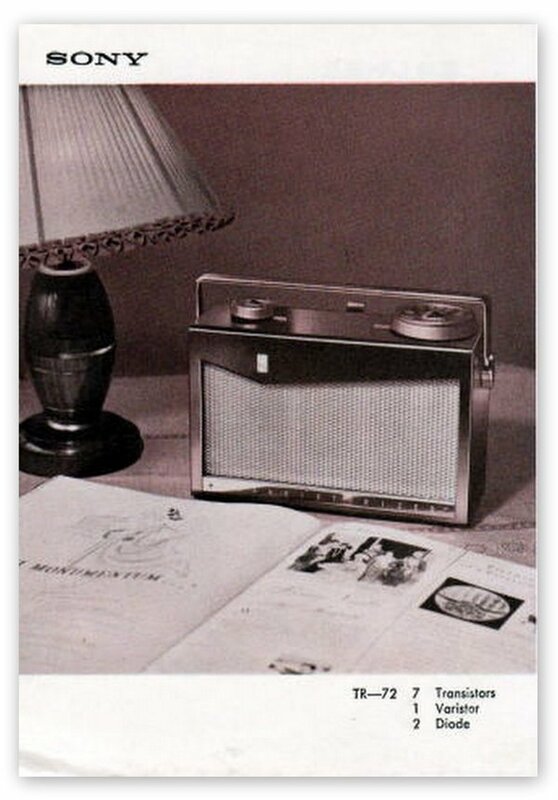 On his fine website 'RadioWallah' collector Alan Kastner states "Sony implemented loads of design changes as production went on, and the early units differ quite a bit from the later ones." I interrupted Alan's recent interlude in Toronto and he graciously answered some of my questions regarding the TR-72. I've edited his answers slightly. What are the earliest and latest serial numbers that you know of? There are a couple of super-early numbers I've got in photos with me. Both of these units belong to friends in Japan, S/N 961 (Yep. A three-digit number!!) and S/N 1333. I'm less certain about later serial numbers, but I'm pretty sure I've seen a few later than Michael's (collector Michael Jack has an example with a serial number of 53314). If memory serves me correctly, they extend up towards 58,000 or 59,000. If serial numbers go upwards of 58000 then wouldn't that tend to indicate that Sony manufactured more than the 40000 thought to have been made? Do you know if they were ever made with the new Sony logo on the front? Not to my knowledge, no. 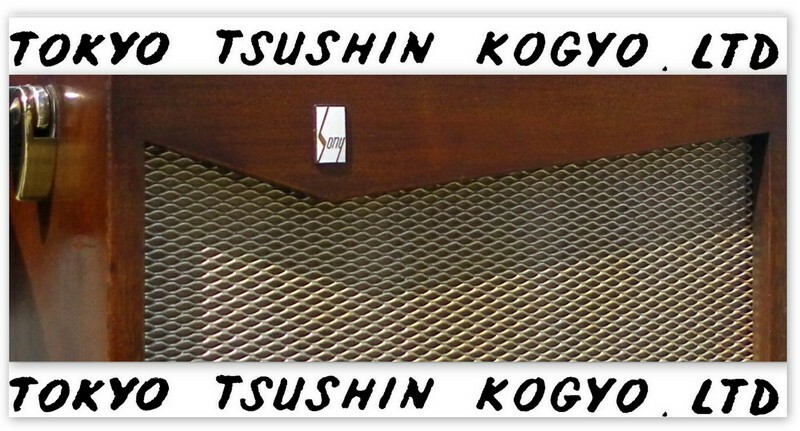 Of course, the brass strip along the bottom of the back panel did change from Totsuko (Tokyo Tsushin Kogyo Ltd ) to Sony Corp when the company changed its name at the beginning of 1958. 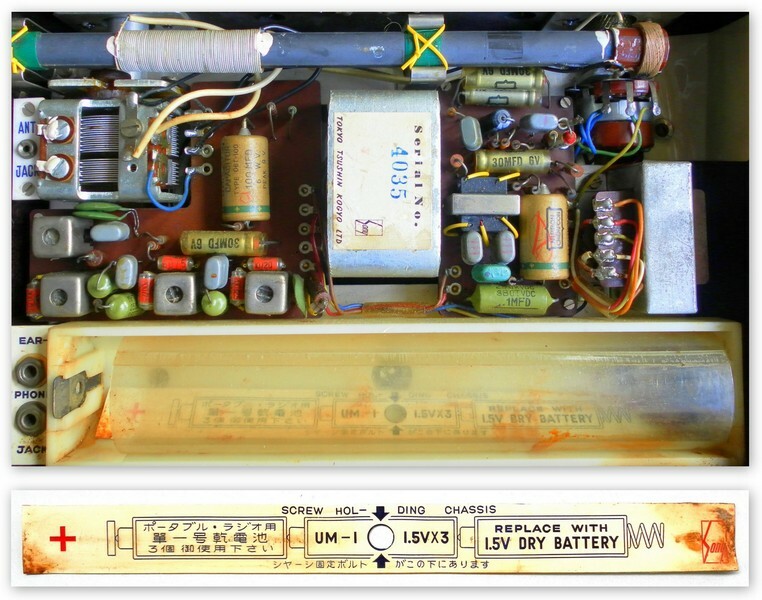 The front panel that read TRANSISTORIZED on earlier units also changed to SEVEN TRANSISTOR later on. Alan continues and points out more identifying features prominent on earlier models? 1) A white vinyl strip in the battery holder that is colored with red and blue print. 2) A white vinyl earphone holder. 4) Two ferrite bar antennas inside, which were held down by metal clips. 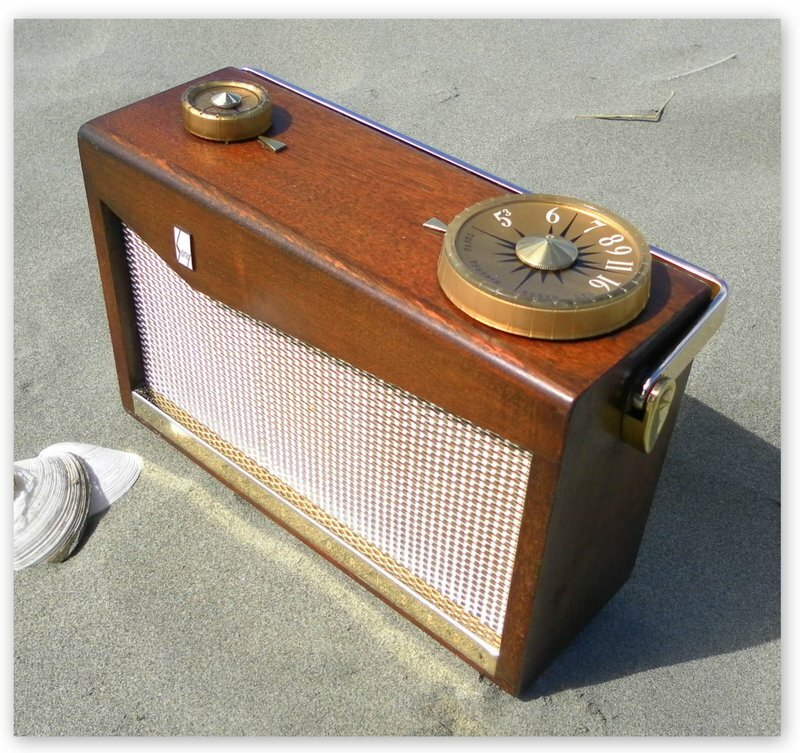 5) The first few thousand also had brass carry handles, while all later units had anodized aluminum handles. I could go on and on forever with these and other details?. Alan finishes by emphasising the following. The entire circuit board was changed a little prior to reaching serial number 30,000. That was at a time when transistor [device] production had stabilized, true mass production had been achieved, sales were way up, and newer, better versions of the transistors and other components used were released. While less interesting to collectors of the earliest "hand-built" sets, the newer circuit board meant improved performance as well as a major price reduction to the consumer.